Race Day Tomorrow | Run Inspired. Tomorrow by this time I hope to be fat, happy, and asleep in my bed. The race starts at 7am and honestly, I have no idea what time I’ll be finished. I missed probably the most important part of my training so tomorrow will be an adventure/experience to say the least. In my mind, I have the race broken down into three parts: the first 10 miles where there will be lots of crowd support, the next 14 miles on the greenway which are the hilliest and loneliest, and the last two miles coming off the greenway and running to the finish line. As with most marathons, the middle part will be the hardest. Today, I made a playlist of 56 songs that I hope will be all I need to run the race. It starts with Eminem’s Lose Yourself and finishes with Eminem’s Solider followed by Fast Lane. In between there I have reggaeton songs (my Spanish background 🙂 ), fun upbeat songs, more Eminem and a few old school songs. At first I was debating on whether or not to even listen to music, but then I decided I would mentally need the distraction and the motivation. My goal tomorrow is go out at an easy pace that I think I can maintain for 26.2 miles. Tomorrow is not my day to PR. I am not trained enough and this is not a PR friendly course. My motto will be one mile at a time, and when I start questioning my sanity, I’ll remember to just be thankful for the ability to run. It’s just running and I’ll be finished by the time some people are waking up. That sounds like a productive day to me. I would also like to say congratulations to the Run Inspired ladies who will be running tomorrow. Jenny, Jenny, Emily, Anna, Maria, and Courtney – you have all worked so hard and I am so proud of you. 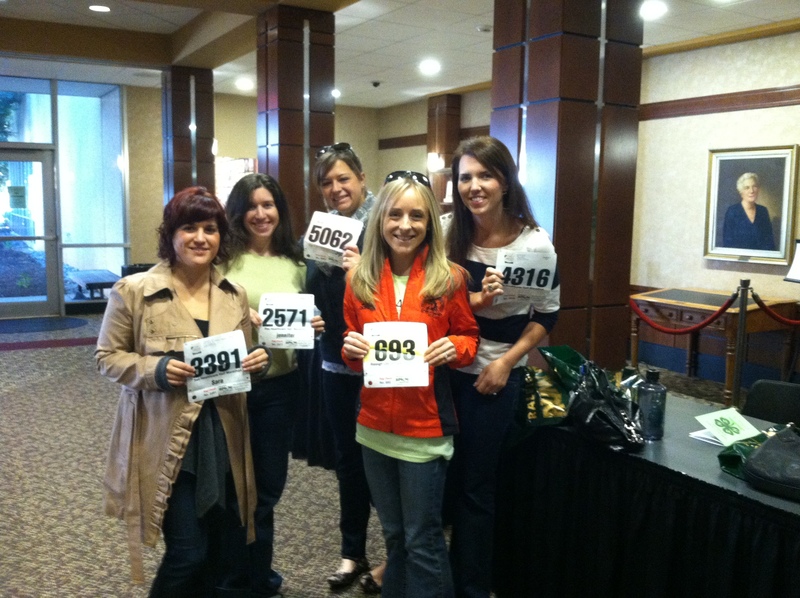 Sara, Holley, and Kristy – I’ll be looking for you along the course!! 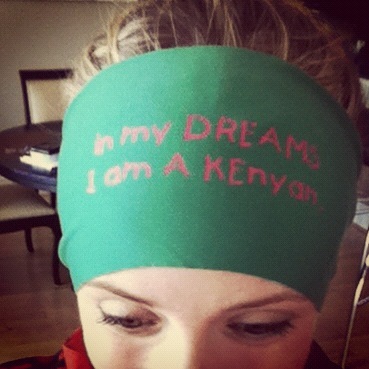 My new headband from Jenny – thanks guapa! Looking appropriate for running and an 80’s party . I just want to make sure you see me coming! Have a great race tomorrow and keep the great attitude! Maybe you will end up surprising yourself 🙂 can’t wait to read about it! Thank you Katie! I’ll be sure to remember “positive attitude” tomorrow when I start getting a little bitter 🙂 Hope the Myrtle Beach training is going well!